The Whitetail Lodge is a year round vacation spot, located just one mile from the entrance to the Snowshoe Ski Resort, which is one of the premier slopes on the East Coast. There are 750 acres of National Forest across the road and one can freely roam on the old logging trails and explore the unspoiled mountain setting. The Cass Railroad is only five miles away, a historic railroad town replete with running trains, an old general store, and many original homes. The Green Bank Radio Observatory has the world’s largest moveable telescope / radio dish, is only minutes away, and is open to the public. This is one reason we have limited or no cell phone service in this part of the mountains. Other area offerings are the Greenbrier Trail for hikers and mountain bikers, the Raven Golf Club course (ranked in the top twenty in by the Golf Week Magazine), the Greenbrier River for fishing and rafting, and miles and miles of open roads for motorcycle rides and scenic viewing. After a day spent enjoying the colors of the fall foliage, or vacationing hard while enjoying more physical activities, escape back to the tranquility of the Whitetail; have a drink while you cookout on the deck, followed by relaxing in the bubbling hot tub under a canopy of stars…often appearing to be so close you feel that you can almost touch the Milky Way. You can then retire to the home theater (55” cable TV and surround sound) to enjoy your favorite DVD or CD, drop down to the first level to play foosball with friends and family, or find quite solitude on the back deck or another part of this spacious and well appointed home. This lovely home is conveniently located on Route 66 in the Eagles Nest development, located between The Cass Railroad (which is approx. 5 miles to the east) and the upper Snowshoe Resort access road (one mile to the east). This luxurious 4 bedroom, 3 bath home boasts a master bedroom on every level (each with an en suite bathroom), wrap around deck on the front, a small deck on the back, and a balcony off the loft bedroom. The first floor master bedroom has a jetted tub and separate walk-in shower. The main floor has a master bedroom and a second bedroom. The upper level has a master bedroom and a loft area…all told there are beds for 11 plus a sleeper sofa, 13 in all, and plenty of room for adults and children to enjoy separate activities. There are TVs and fireplaces in the main sitting rooms, a large, rustic dining table, and a well appointed kitchen for your enjoyment. Whether you relax in the hot tub, snuggle in front of a fireplace, or stargaze from a deck, we are sure you will have a grand experience. The driveway off Route 66 is packed gravel; however, four wheel drive is highly recommended (if not a necessity) during the winter months and chains are recommended for REALLY heavy snowstorms. Remember, we live in the mountains!! Keywords: Private mountain retreat near Snowshoe Ski Resort. A year round vacation spot offering hiking, biking on the Greenbriar River Trail, fishing, golf at the Raven Golf Club (one of the truly great golf courses in America, designed by Gary Player), and hunting (in the National Forest directly across the road). The Greenbank Radio Observatory and the Cass Historic Scenic Railroad are nearby. Whitewater rafting is available (March & April) or you can just sit in the hot tub or on the wrap around porch and stargaze in the peace and quiet of the mountains. 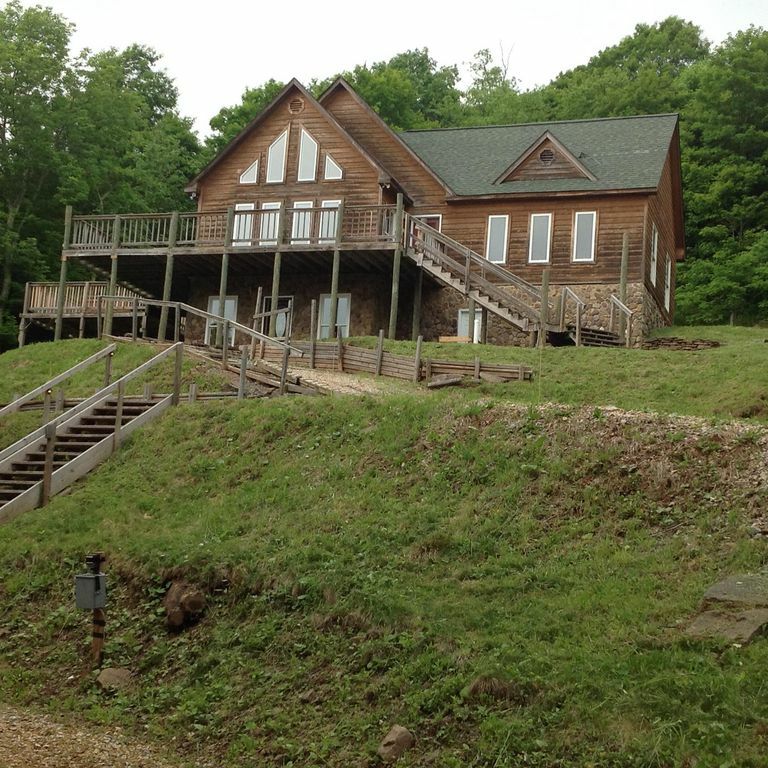 Whitetail Lodge WV is privately owned by two couples who love the beauty and seclusion of the mountains. We built this 'cabin' with comfort and accessibility in mind...and both have been accomplished! Come see for yourself and experience a few days high in the mountains of West Virginia. We chose this location because it is easily accessible, has 750 acres of National Forest across the street, the newest entrance to Snowshoe Resort is one mile away, and yet it is very secluded! Other nearby attractions are Cass Rail Road and the Greenbank Radio Observatory. The privacy, stargazing and quietness offered are unbelievable after enjoying a day of fun activities. All bed linens are provided..
Lower level area for parking is available on driveway as well as an upper level area. Towels are provided for guests use. Large dining table with chairs for eight and four bar stools. Upstairs master bedroom has balcony facing mountain at back of property. Resort entrance one mile away. Raven Golf Course is less than a mile away. Whitetail Lodge is great for groups/families visiting Snowshoe. It's only 10 minutes from the mountain but feels secluded and private. There's plenty of space for everyone to spread out, and the hot tub is great after a day on the slopes. Gillian was awesome and made sure we had everything we needed. There is no internet or cell service at the house. It's nice to be offline but it can be difficult to coordinate where and when to be somewhere if your group splits up. I also suggest that you use GPS or write down directions to the house. Overall, we had a great time and will definitely look into staying again next season. Our 4th visit to Whitetail Lodge was another great trip! Our group enjoyed another long weekend disconnected from the rest of the world at Whitetail Lodge. The new hot tub is fantastic! Thanks for having us again! We thoroughly enjoyed our stay. The location is very convenient to Snowshoe. The house is well maintained and furnished. This is a perfect place for a large family or a small group. The owners were very friendly and helpful during our stay. A warning though (not a discouragement) - the house is on a steep hill and it can get icy in the winter. Four wheel drive is a must. In addition, there is no internet. We actually enjoyed the opportunity to disconnect from our jobs and other distractions. However if you are an internet or smartphone fiend, you will be disappointed. We were guests in this house in mid October. The weather was absolutely beautiful with nice breezes and a surprise snow the last night there! The owners make every effort to assure your comfort. There were 10 of us, all senior ladies and multiple ones commented on how comfy the beds were. One of our group struggles with stairs so we were glad of the nice bedroom on the entry level (which had a jetted tub). The kitchen was bigger than it looks in the pictures. We enjoyed the TV room and had a popcorn and movie night, it was easy to program the TV. We look forward to another trip in the future, this was the closest SS house to Cass and that was our goal, as we were driving our ponies along the Greenbrier River. If you are a biker or hiker there is a large parking lot near the Railway station with a trail head adjoining the area. If you are a horseperson EJs Stables is about 22 minutes away. The house is Not listed as Accessible, and in fact you need to be able to ascend a pretty steep driveway and climb stairs. Also near the golf course. I write with hesitation at someone else taking the property when my group likes to come up. We were up in January and there was a snow storm when we were there. The property is 10 minutes away from Snowshoe, but the roads were clear and with a little caution were totally safe. The driveway is off the main road which was always clear. The three floors with beds, couches, and pull out sofas gave our group of 13 good places to sleep, but it is a big enough house with plenty of room to stretch out and feel comfortable. There were enough TVs to watch a variety of shows during downtime. We entered through the basement which has ample room for removing ski and snow gear. The kitchen could be a little small if you were looking to prepare a complex meal for a max size group, and the right side of the home could get rather cold. However we were there in the winter so colder temperatures should be expected. Pay attention to the fine print, when they say there is no communication up there without a phone card they mean it. SO CLOSE YET SO FAR AWAY = The drive up was nothing when compared to the feeling of being in your own world, with your friends and no outside distractions. Would definitely recommend and hope to return in the near future. Until confirmed rates are subject to change. Guests will be asked to leave a check for house manager on the counter for house cleaning, trash disposal fee and hottub prep of $285. Additional discounts may apply for a week or longer stays.